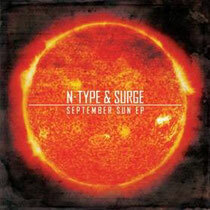 N-type & Surge return with the ‘September Sun EP’, a new four-tracker which kicks off with the title track, featuring the smooth chanteuse Pyxis, fresh from her previous outing on Surge’s ‘Leech’. Here though the bass for her vocals to float over the top of. ‘Mega-tron’ features a large cinematic intro, lead guitar and a drop into some future b-line madness. On ‘Triangles’, the guys get back to some dark sinister meanderings, full of spooked FX, echoed vox and creeping bass that takes hold and never lets go. Next, ‘Zombie Apocalypse’ comes along and gets ready to eat you up and swallow you whole with a chugging b-line. Free track digital track, 'Stand Your Ground', with the vinyl or digital bundle when bought from the Wheel & Deal web store. The chanting of soldiers and the smashing of shields adds to the rolling percussion and subbed out twisted reese bassline. Interestingly this is built in an 8-bar structure, a format championed by the likes of Wiley & Musical Mob. Out now.